This morning’s Economist espresso served up a warning on the current asset price boom. The US and UK’s stock markets are at record levels; Japan’s is at a 15-year-high; and the EU’s is at a 7-year-peak. The asset price boom is the result of central banks’ extraordinarily accommodative policies. The prospect of economic recovery in the US has added fuel to the fire. But just how overvalued are stocks? And what is the extent of the financial boom? 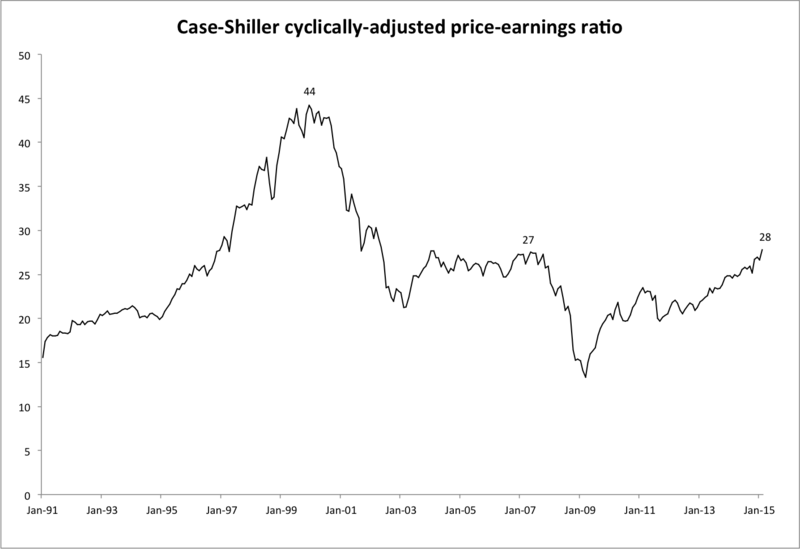 The Case-Shiller cyclically-adjusted price-earnings ratio (CAPE) is a good measure of the general level of stock price valuations. CAPE’s long-run average of 16.6 is sometimes taken as a benchmark. I have never found that satisfactory. The ratio uses the 10-year moving average of earnings as the denominator. Expected future earnings may easily be considerably larger or smaller depending on whether one is coming out of a long recession or a long war, et cetera. Still, at 28, the CAPE has already crossed the level prevailing before the crisis. There is another reason the policy tensor is dissatisfied with CAPE. It only looks at the stock market. But a financial boom may migrate from the stock market to other assets and back. The current financial boom extends far beyond the stock market. In particular, bonds seem to be overvalued as well. One can’t simply throw in corporate bonds and divide it by earnings. That is not a meaningful ratio since interest payments get deducted from earnings. In order to come up with a meaningful ratio, one must find a suitable denominator. I have found just such a measure that I call the balance sheet ratio. For the numerator we choose the total liabilities of US nonfinancial firms, including equity and debt. For the denominator, I selected total capital stock of all US nonfinancial firms, available from the Bureau of Labor Statistics. This includes all productive assets of US nonfinancial firms. One can think of the firms using these assets to generate revenue from which they have to pay both their bondholders and their shareholders. The total liabilities of firms, equity plus credit, must be serviced by their future revenues. The idea is that if the price of assets get bid up excessively, it should show up in a higher balance sheet ratio. 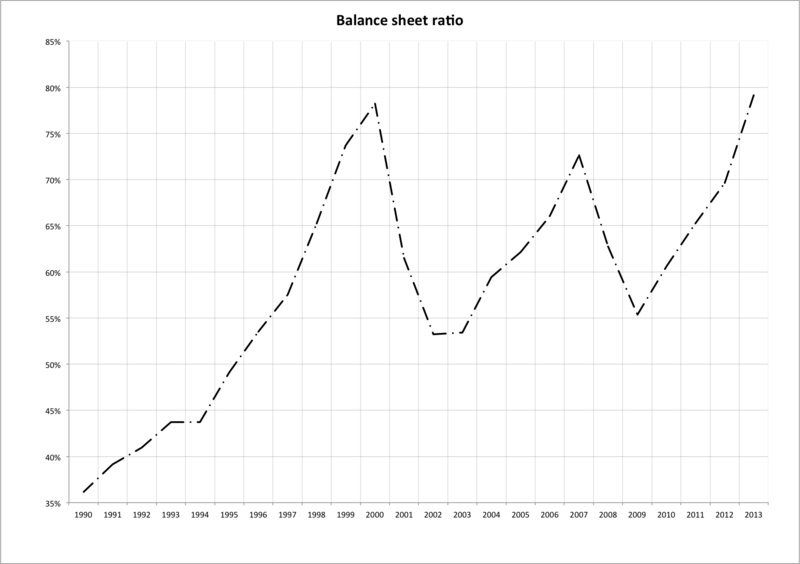 Should we expect the balance sheet ratio to stay constant over time? The short answer is no. One should expect the ratio to rise over time if the return on deployed capital, firms’ physical and intellectual assets, is increasing over time. 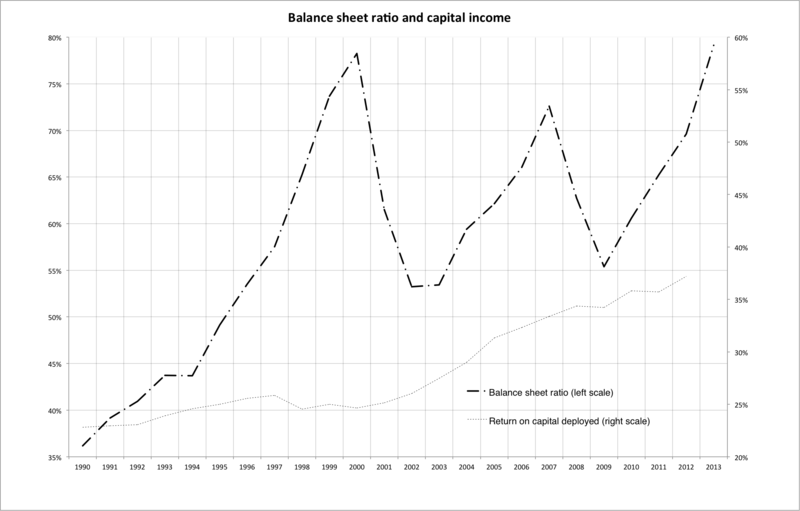 The chart below shows both the balance sheet ratio and the return on capital deployed. We can see that the return on deployed capital has been rising since 1990. And that this rise accelerated in the 2000s. I regressed the balance sheet ratio on the return on capital deployed. I performed two regressions. The first with the 1990-2012 data and the second with 2000-2012 data. The number of observations in the second regression is too low to give us much confidence. 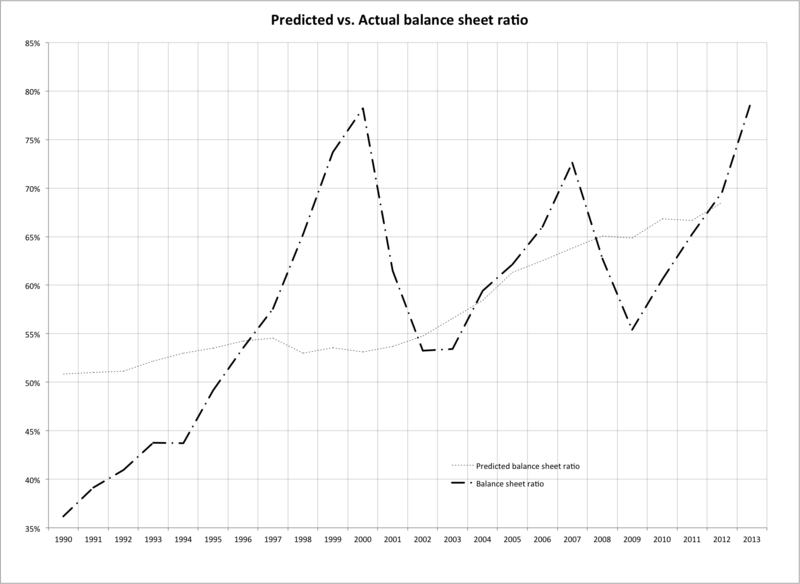 Moreover, due to the asset price boom of the 2000s, the predicted values are overestimates. 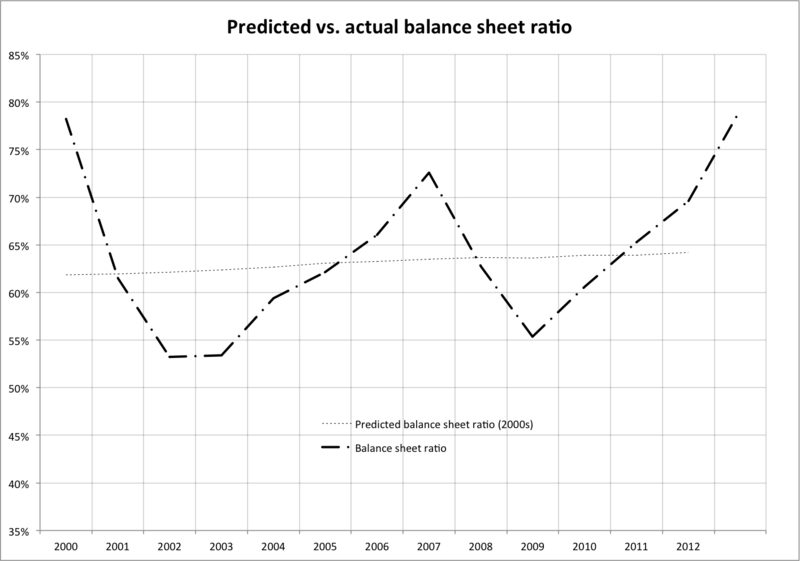 Still, I provide charts of predicted vs. actual balance sheet ratios for both. A fairly coherent picture emerges from these charts. 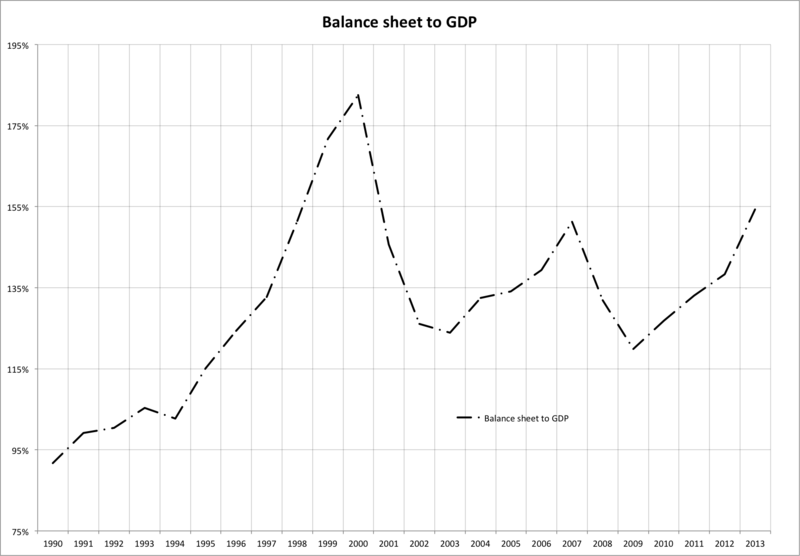 The size of corporate balance sheets is unwarranted by fundamentals. The balance sheet ratio measures both the stock market boom and the credit boom. No matter how you slice and dice it, we are in the midst of a major financial boom.